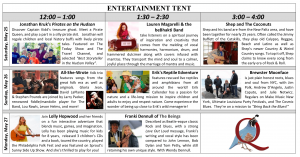 Click Here for the Entertainment Tent Press Release!! The Entertainment Tent at the Woodstock-New Paltz Art & Crafts Fair has become a prominent forum for musical talent in the Hudson Valley. For the schedule of children’s activities, head over to the Children’s Tent page.